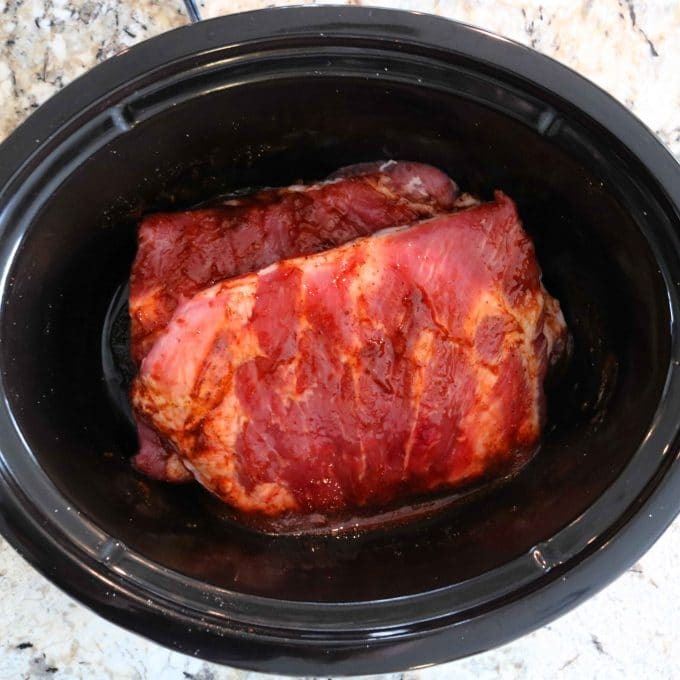 This recipe for Slow Cooker Spare Ribs is as close to ribs hot off the pit as you’ll get, and although cooked indoors and in a crock pot, they yield the perfect bite with a burst of big BBQ flavor. Best of all? They’re seriously easy to make. 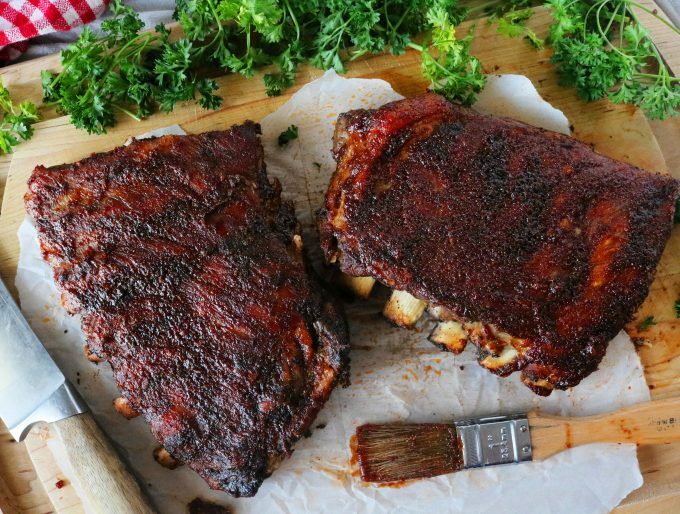 The initial prep for these ribs takes all of 10 minutes, making them the perfect choice for getting ahead of the dinnertime rush. 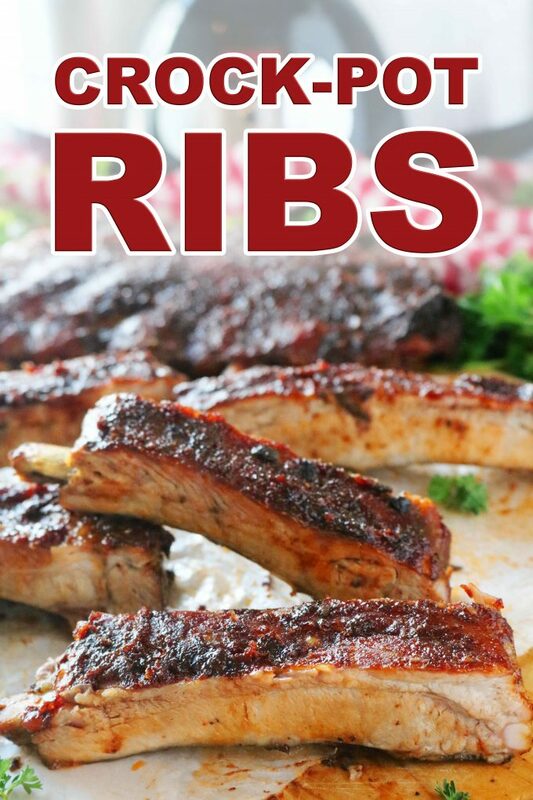 In addition to a simple recipe for slow cooker ribs, we’ll also cover helpful topics like what to look for when purchasing ribs, a surefire way to tell if your ribs have gone bad, how many racks you’ll need for serving purposes, and so much more! When buying ribs, look for meaty, plump ribs with a pink, almost reddish tinge to it. When it comes to Spare Ribs specifically, you’ll want to avoid packages with a visibly heavy layer of fat running across the top. It’s a fatty cut of meat by nature, and the less trimming involved, the quicker you can get to cooking. HOW MANY RACKS OF RIBS TO BUY? There are typically 10-13 ribs on a rack of St. Louis Style Spare Ribs. Some ribs will be meatier than others, but you can count on people eating anywhere from 2-4 ribs per person. Most of the time it is safe to say one rack will feed four people. 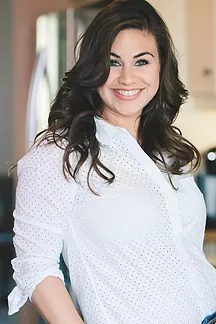 For example, with my family of four (myself, husband and two young daughters), we typically have leftovers with just one rack, but if you are hosting a hungry crowd, you may want to grab two racks of ribs. If you open a package of pork ribs and there is any scent of sulfur or rotten eggs, you should discard of it immediately, or seal it and return it to the store. Spare Ribs come from the side/belly of the pig — the same place bacon comes from, which is also the fattiest part of the pig. Regular Spare Ribs contain the brisket bone and the surrounding meat, which can result in a very large cut. St. Loius-Style Spare Ribs, on the other hand, is a more manageable cut in which the surrounding meat has been trimmed to produce a narrower, more rectangular rack. ST. LOUIS-STYLE RIBS VS. BABY BACK RIBS | WHAT’S THE DIFFERENCE? As mentioned earlier, Spare Ribs come from the side/belly of the pig. Baby Back Ribs, however, come from the loin section of the pig and are much leaner than Spare Ribs. The loin is the most tender part of the animal which is why Baby Back Ribs are more expensive than St. Louis-Style Spare Ribs. Although St. Louis-Style Ribs are not as tender as Baby Back Ribs by nature, they do have something going for them — fat. And, as any good cook knows, when meat is done right, fat equals flavor. Cooked low and slow, the fat renders out and tenderness sets in making these BBQ Slow Cooker Spare Ribs seriously flavorful. They begin with a rub from a concentrated BBQ sauce (more about that below), then it’s off to the crock pot for some slow cooking, and they’ll end with a sweet and sticky, caramelized topping thanks to a quick run-in with the broiler. When ribs cook in a slow cooker, they release a fair amount of both liquid and fat. Therefore, we don’t necessarily need any additional liquid from the sauce…just flavor. The sauce for these Slow Cooker Spare Ribs lies somewhere between a BBQ sauce and a rub. It consists of ketchup, brown sugar, Worcestershire sauce, and a mix of spices. The sauce is thick in consistency and the flavor is very concentrated, and this is exactly what Slow Cooker Spare Ribs need in order to build maximum flavor in a crock pot. Remove the membrane (if desired) and cut the rack in half. Rub sauce on ribs and place in slow cooker. Top with more sauce, and cook 3 hours on high setting. Brush with more sauce and broil. 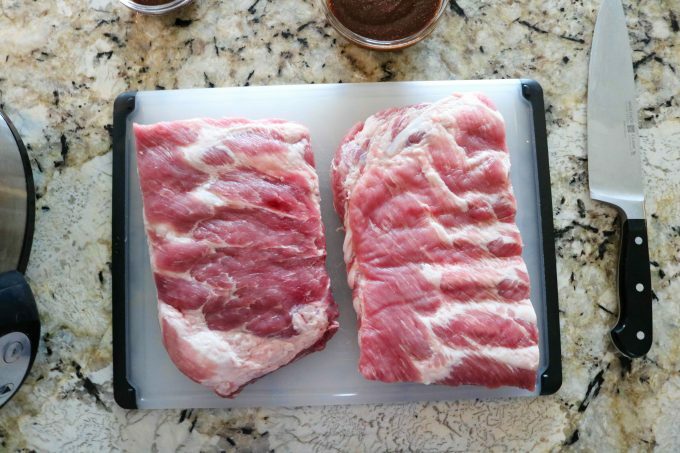 In order for Spare Ribs to fit in the cooker, you’ll first need to cut the rack in half. Just find a meaty portion part somewhere near the center of the rack, and using a sharp knife, cut in half. However, before you do this, you might want to consider removing the membrane (a.k.a. the silver skin) from the back of the ribs. Removing the membrane can make eating ribs a more enjoyable experience, but it is not entirely necessary as the membrane is completely edible. To remove the membrane from the back of ribs, wiggle either the end of a spoon or fork underneath, grasp the membrane with a paper towel and pull it away from the ribs. You could also use a sharp, flexible knife to help you get hold of the membrane. The concentrated BBQ sauce for these Slow Cooker Spare Ribs is extremely easy to make. All you have to do is add the ingredients to a bowl and stir. Be sure to set a 1/4 cup aside for the broil. After the sauce has come together, you’ll rub down the ribs, add them to the slow cooker and top them off with a little more sauce. Set your slow cooker to high and cook for 3 hours. This is all the time it takes for your ribs to reach the perfect consistency. You could also cook the ribs for 6 hours on the low setting. If you want a sticky, sweet rib that tastes just as good as those coming in hot off the grill, you’ll most definitely want to broil the ribs before plating. This is a quick and easy step, and the payoff is huge. The slow cooker is technically used to braise meats, which is perfect for tenderizing tough cuts like Spare Ribs, however, it’s not necessarily conducive for sauces staying put. That whole pesky steam/condensation effect really gets in the way. The ribs will be flavorful, thanks to the concentrated BBQ sauce you made, however, if you want a rib well-equipped with a lovely caramelized topping, broiling is the answer. Turn on the broiler about 10 minutes before your ribs finish in the slow cooker. 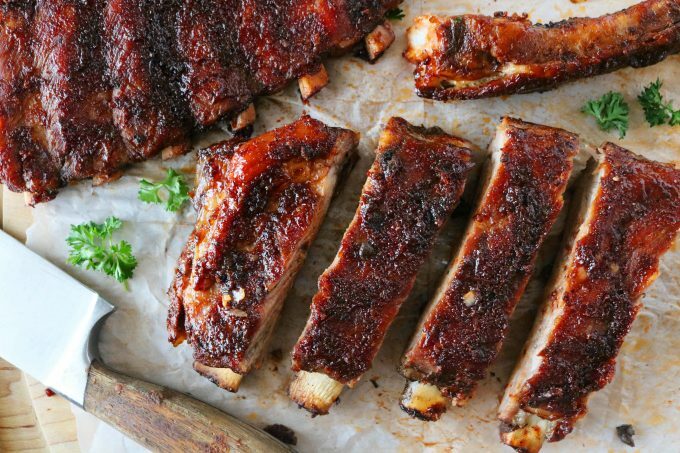 Once the ribs are finished, transfer them to a rimmed baking sheet and brush them with the concentrated BBQ sauce you set aside at the beginning. Broil for 3-5 minutes, making sure to keep watch so they do not burn. 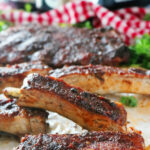 BBQ Slow Cooker Spare Ribs pair wonderfully with tons of sides. From side dish casseroles to vegetables to salads to beans and potatoes, your possibilities are just about endless. My family absolutely loves this dinner. It’s something I can quickly get started with just a few minutes of spare time on any given day of the week, and serve knowing I’ll receive thanks and smiles in return. 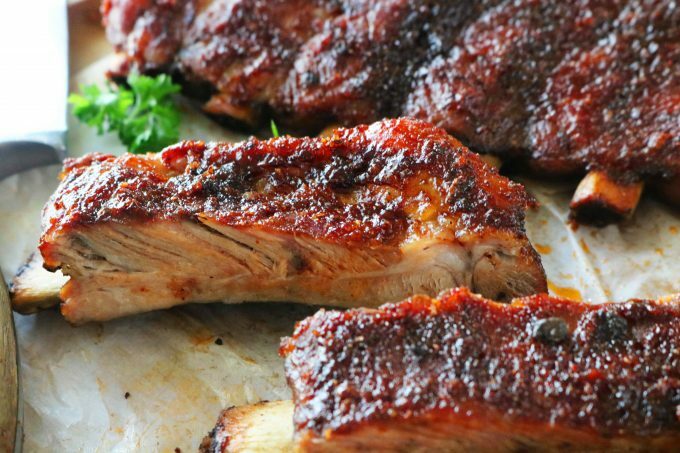 With this recipe, you can easily serve up a batch of Slow Cooker Spare Ribs that look and taste just as good as ribs done on the pit. Please, enjoy! Country-Style Pork Ribs feature country-style ribs slow cooked to perfection in a sweet and sticky sauce. BBQ Pulled Pork in the Slow Cooker is a budget-friendly easy dinner idea and a total life-saver for busy weeknights! Braised Short Ribs are braised in a red wine sauce with fresh herbs and mushrooms, and come out perfectly tender. Serve over polenta or mashed potatoes! Pulled Pork Sliders were made for feeding a crowd, but also make for a great kid-friendly dinner option! Roast Beef Po’ Boys feature succulent, juicy beef cooked in the crockpot and end on fresh French bread piled high with toppings! Flavorful and tender Slow Cooker Spare Ribs with just 10 minutes of prep! If desired, on a large work surface, carefully remove the membrane from the back of the ribs (if desired) and cut the rack of ribs in half. Add the remaining ingredients to a small mixing bowl and combine. Set aside a 1/4 cup of the mixture for when the ribs come out of the slow cooker. Use half of what remains to rub all over the ribs, then, place them in the slow cooker, and pour the other half on top. Stack the ribs in the slow-cooker and turn on the high setting. Cook for 3 hours. 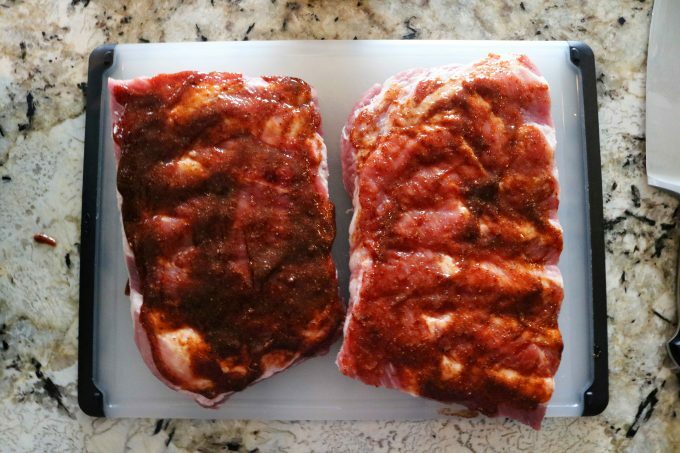 Turn on the broiler and transfer the ribs to a sturdy, rimmed baking sheet lined with aluminum foil. Brush liberally with the reserved 1/4 cup of sauce and broil until the sauce bubbles across the top of the ribs. Watch closely in the broiler. Remove from the oven and allow to cool slightly. Cut the ribs into individual portions, serve and enjoy! SOURCES: Cook’s Illustrated Meat Book | Primal Cuts of Pork, p. 180, 182. These ribs look amazing! 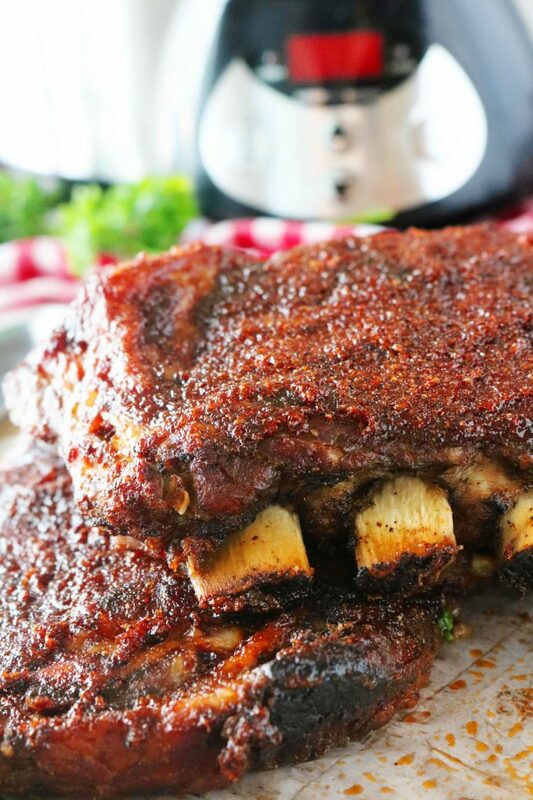 I’ve never thought of making ribs in my slow cooker but this is a recipe I really have to try! These spare ribs look amazing! I love the idea of making them in the slow cooker so that I can make this recipe anytime I want. I am drooling over this! Love all your tips and tricks to getting this right, especially the broiling part! My kids love ribs and I don’t make them enough! Need to try this recipe soon! How delicious to come home to this! These ribs look amazing, and the sauce is perfect. I’m thinking it’s time to dig out my slow cooker…. 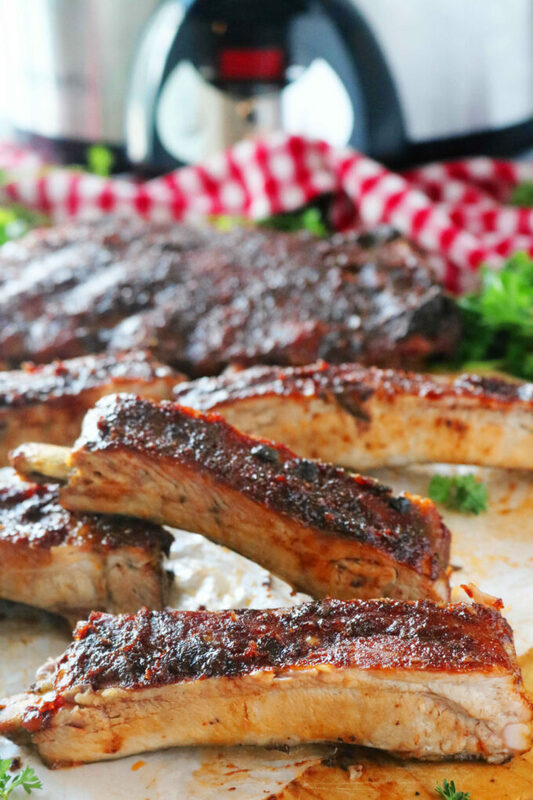 These ribs are ah-mazing! They are so easy to put together and I love the sauce! Perfect for the family to enjoy! Ribs can be difficult for some to make but you make it easy to follow to get the best ribs every time! Will be trying all your tips and hints! They look SO good! Only 10 min. prep and probably 10 min. to lick the plate clean!! Tasty and easy & are my most favorite things!!! So juicy and a great way to prepare ribs! Love it!! These ribs look so delicious! The sauce is so flavourful. Love that it only takes 10 minutes to prepare too. It’s a must-try! That’s wonderful! Thank you, Autumn 🙂 Hope your sweet family enjoys them!